To celebrate the site’s new version, Horlogerie-Suisse.com and Habring² have created a very limited edition of the Habring² Doppel 3 split-second chronograph. The Doppel 3 clearly reflects its origins, since it harks back to the sports timekeepers of the late 60s. Totally representative for the inventiveness of its creators, the Doppel 3 stands out technically for its artisan crafted mechanism, which demonstrates a rare ingenuity. The A08MR MONO calibre has reduced the start-stop-reset function of the split-second chronograph to a single push-button. This highly accomplished watchmaking movement has all the hallmarks of their small artisan manufacture. A chronograph, a precision escapement and great reliability are exactly what you might expect from a very small-series production and the meticulous assembly skills of Habring2. The little family team at Habring2 is punctilious in its work, producing only around twenty Doppel 3 pieces per year, 5 of which are reserved for Horlogerie-Suisse. This highly limited edition features a unique white dial with royal blue leaf-shaped appliques and hands. 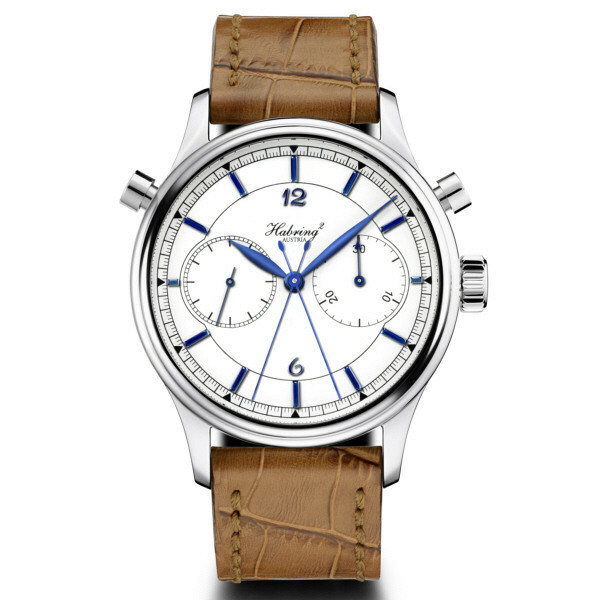 The 42 mm diameter stainless steel case, sporting a domed sapphire crystal with double-sided anti-reflective coating, is made of 3 parts and water-resistant to 50 meters. The words ‘LIMITED EDITION No. 1/5’ discreetly engraved on the caseback emphasise the rarity of this collector’s item.